If you are reading this and have not seen "In the Bedroom", I advise you to stop reading now. For "In the Bedroom" is the kind of film where it is best to go into without any previous knowledge just let the film take you where it will. What I will tell you is that "In the Bedroom" has a lyrical quality that rings true with any audience, and feels real without any of the small-town stereotypes. As the film opens we are introduced to the relationship between Frank Fowler (Nick Stahl) and Natalie Strout (Marsia Tomei). Natalie is married to Richard Strout (William Mapother), who she is in the process of divorcing while Frank is still in college. Richard is, for obvious reasons, not happy about Natalie leaving him, even with a troubled past like theirs. 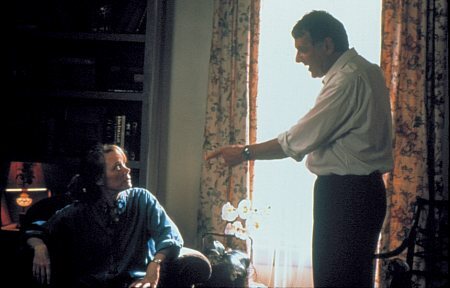 Frank's parents, Ruth and Matt Fowler (Sissy Spacek and Tom Wilkinson, respectively) are divided on the issue. Ruth doesn't think highly of her son with a married woman, Matt thinks they are fine together; young and in love. Then, the film takes a startling turn. I will not say what it is, but it takes the film in haunting new directions. The film switches to the parent's perspective, and how that event is slowly tearing them apart. All of a sudden silences become unquestionably tense, glances are worth a thousand words and trust becomes questionable. Matt and Ruth start to become columns of solidarity, but we know that they must confront each other. In that moment the film reaches a heartbreaking climax, although bringing little conclusion. The two are now at peace with their fears of each other, but the weight of grief is still weighing them down. In the final act, the film's steam fizzles. "In the Bedroom" finds conclusion, in an incomprehensible and unbelievable way. I found the end to be too easy an answer to the Fowler's problems. Up until then, "In the Bedroom" felt poetic and human, but the last twenty minutes are unremarkable and uninteresting. Too many films take the easy way out and I was praying that "In the Bedroom" wouldn't, but alas, it feels the need to shake the audience one more time before it is through. I felt it was unnecessary, and I didn't feel any of the impact the ending intended. Even though the whole idea of the conclusion being what it is didn't work for me, it was still executed incredibly well on the part of the actors. Good acting can grip us, but great acting makes us forget that anyone is acting at all. The cast knows their characters inside out, and they create real people. We really feel for them, we want to reach out to them, pat them on the back and say "There there, everything's going to be all right." Tom Wilkinson and Sissy Spacek are getting a lot of award buzz, and rightfully so; their honest, heartfelt performances are among the very best of the year. "In the Bedroom" is the kind of debut that everyone wishes they could make. It's a haunting, humane film that's part thriller, part crime drama, and it all feels like it happened next door. It may trip a little in the end, but it is so masterfully done that this complaint can almost be overlooked. "In the Bedroom" is a moving, incredibly well acted achievement; I look forward to more from director Todd Field, a masterful new filmmaker. "In the Bedroom" is rated R for some violence and language.